For centuries, it was the national symbol of a nation. For decades, it was kept in Fort Knox for safekeeping. The Crown of Saint Stephen dates back to the year 1000, when Stephen, a devout Christian and the patron saint of Hungary, became King and Pope Sylvester II gave him the crown as a gift. From the twelfth century onward, the Crown of Saint Stephen was used in the coronations of some fifty kings. At the end of World War II, the Hungarian crown jewels, along with the Crown, were eventually given to the United States Army by the Hungarian Crown Guard to keep them out of the hands of the Soviet Union. The Crown was kept at held Fort Knox, Kentucky alongside the bulk of America’s gold reserves and other priceless historical items. 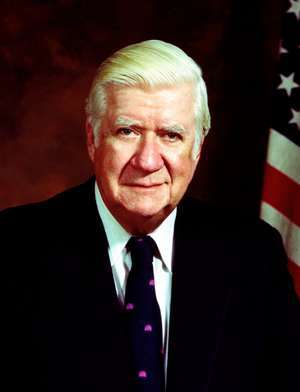 President Jimmy Carter made the controversial decision to give the crown back to Hungary based on evidence that it had improved its human rights record and allowed for travel of its citizens. On Epiphany, January 6, 1978, a U.S. delegation led by Secretary of State Cyrus Vance and including Senator Adlai Stevenson, Congressman Lee Hamilton, and Nobel Prize Winner Dr. Albert Szent-Györgyi, returned the crown to Hungary. Relations between the United States and Hungary subsequently improved, which helped pull Hungary even farther from the USSR and allowed Hungary to be granted Most Favored Nation status with the U.S. This meant reduced tariffs and increased trade and an eventual liberalization of the economy. The Crown of Saint Stephen is now on display in the Hungarian Parliament (photo at bottom of page). Kevin Smith, who served as political officer in Budapest from 1973-76, describes the tense relations with Hungary at the time, which were still languishing in the shadow of the brutal 1956 Soviet crackdown and Cardinal Mindszenty’s 16-year asylum in the embassy. Stephen Dachi, who was born in Hungary on the eve of World War II, discusses the importance of the Crown and Most Favored Nation (MFN) trade status to the Hungarian government and how lack of progress on these two issues blocked the possibility of closer ties with the Kadar government, which had become more tolerant than others in the Eastern bloc. Philip Kaiser, Ambassador to Hungary from 1977 to 1979, talks about his role in helping return the Crown to Hungary, the sharp resistance they encountered, and the guts President Carter showed in making the decision. Smith, Dachi, and Kaiser were interviewed by Charles Stuart Kennedy in April 2004, May 1997, and May 2005 respectively. 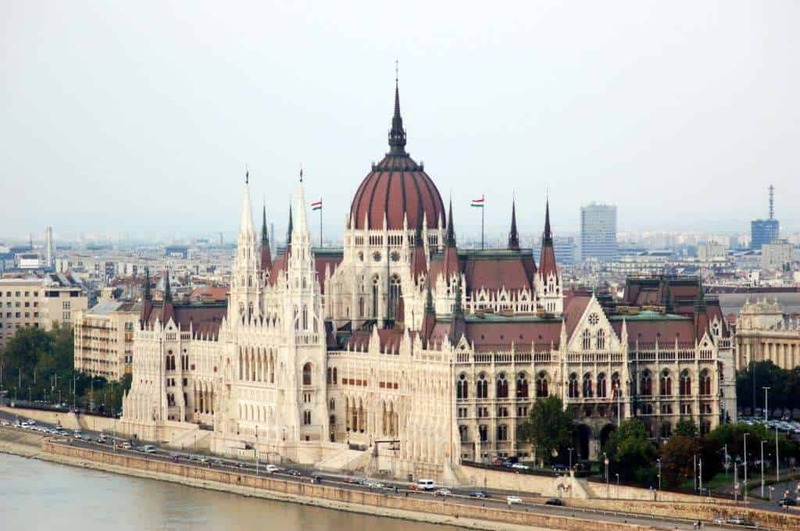 Go here to read about Hungary after the fall of communism. Read about how Dachi helped with the forensic identification of the “Angel of Death,” Josef Mengele. Learn more about the return of gold to Czechoslovakia in 1981. SMITH: Our bilateral relationship after the failed revolution of ’56 was not good. Also, back in 1956, Hungary’s Cardinal Mindszenty had taken refuge in the Embassy. That put a lot of stress on the embassy operations and on our bilateral relations. Large, black cars owned by the secret police were kept in front of the embassy 24 hours a day to stop a possible Mindszenty escape. Inside the Embassy, Mindszenty took over the Ambassador’s office. The entire executive area became his private living quarters. The ambassador operated from the DCM’s office. It had been really a rough time for those at the Embassy. While Mindszenty lived in the embassy, one of the embassy officers had to be with him 24 hours a day. After working hours, the embassy duty officer had to sleep overnight on the third floor of the embassy, in part to protect Mindszenty from any attempt to kidnap him. 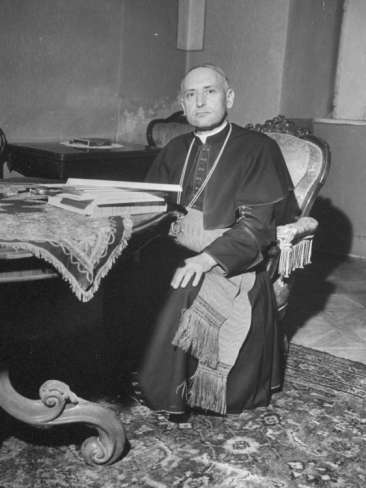 About six months before I arrived, a deal was reached between the Hungarian Government and the Vatican, and Mindszenty was able to leave for Vienna, where he spent the rest of his life. His departure was a great relief for the embassy and bilateral relations were beginning to thaw somewhat by the time I arrived in 1973. In addition, in 1972, the Hungarian Communist Party initiated its New Economic Mechanism, that allowed for a semblance of a market economy to operate for small shopkeepers and some farmers. This policy was viewed by the U.S. as a positive step in the right direction. Unfortunately, these steps toward more open markets were not introduced in industry or large-scale agriculture. 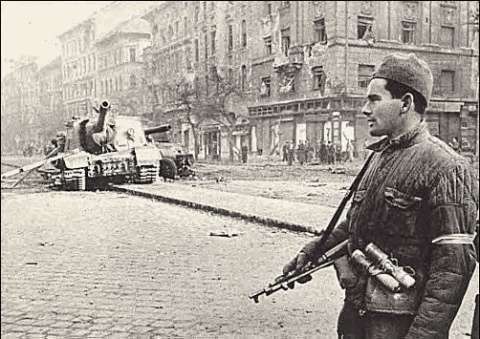 Nor, were other Warsaw Pact countries able to follow the Hungarian example. There was still too much fear in Moscow of people following the 1968 example of the Czech reformers. Q: Was the crown of St. Stephens an issue? SMITH: The Hungarian Communists were not as anxious as they pretended to be to have the crown returned. The crown and regalia were symbols of nationalism that could have been used to stir up anti-Communist feeling. The Kadar Government raised the issue only occasionally. One Communist official confided to me that the crown was safer in Fort Knox than it would be in Hungary, where it could be spirited away to Moscow at any time by Russian troops. In any event, our bilateral relations could never have been characterized as “normal” during my three years. We did not consider the Hungarian people as sovereign as long as the country was occupied by Soviet troops and Moscow dictated Hungary’s foreign and domestic policies. DACHI: There were two key issues at the time that Hungarians felt had to be gotten out of the way before they were ready for serious normalization. 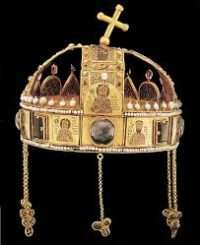 Number one was the return of the crown of St. Stephen. It was something that Hungarian fascist troops fleeing after the Soviet victory at the siege of Budapest in World War II had taken with them and turned over to the Americans, and we kept it at Fort Knox. During the Stalinist period, prior to 1956, there could be no question about returning the crown as far as we were concerned. In fact, the subject never came up. The Stalinist authorities of the time had no interest in the crown. After 1956, there was a new regime installed by the Soviet Union. 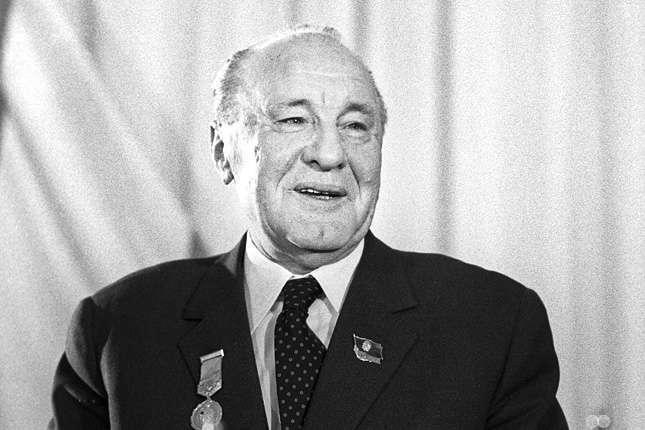 Janos Kadar became the First Secretary of the Hungarian Communist Party and was put in office with the aid of Soviet tanks. He, in fact, stayed as the head man until 1986 or 1987. So, returning the crown remained out of the question for many years. The Hungarian emigre community in the United States was very influential and was adamant about that, but the State Department was firmly opposed to it as well. On the other hand, the Hungarian regime felt that until we returned the crown and thereby accepted the legitimacy of the Kadar regime, something that unlike his pre-1956 predecessors Kadar was desperately anxious to get, normal relations were not possible. They resented the fact that they were not regarded as legitimate by the United States. To them, the key issue was the return of the crown. It was sort of a sine qua non. To us, on the other hand, that was something that would come as the last step of normalization, not one of the first. The other key issue for them was receiving Most Favored Nation (MFN) status, which had, by that time, been granted on an annual renewable basis to Romania and Poland. We wanted to keep that for the later stages also, and linked it with human rights and freedom of emigration issues…. There is no question that the [Hungarians] wanted to engage more. But as far as Hungary was concerned, the price was the crown and the crown was out of the question. As it turns out, the crown was returned in 1978, not that much later, after Jimmy Carter became President. But in 1974 that seemed like a long way off. So, yes, Nixon and Kissinger wanted to engage, but they wanted to engage in the kind of political dialogue that was going to loosen the ties between Hungary and Moscow, the way, to a large degree, in Romania and, to a lesser degree, in Poland it had already happened and, at the other extreme, was not happening at all in Czechoslovakia and Bulgaria. They were hoping that Hungary, which was somewhat liberal on the economic side, could be energized a little bit to liberalize on the political side. In fact, they might have been disposed to do that, but the crown meant everything to them in those days. Q: Was this one of these things where, every time you would sit down with a Hungarian official, the crown would be the first subject that they would talk about? DACHI: Absolutely, the crown and MFN. After a while, we just used shorthand. You would go there and talk about anything, about opening an exhibit or whatever, and they would say, “Well, of course, we’re in the period where the two key issues are awaiting resolution.” They did not have to spell them out. It was just understood. But they referred to the two key issues each and every time, without exception. Our response was that there had to be prior movement on other issues. But even though Kissinger and certainly Nixon wanted to intensify their activities and get more results from Eastern Europe, Hungary, in the grand scheme of things, was on the back burner. Poland and Romania were much more important to us for a variety of reasons. So, it’s not like we were getting constant reminders from Washington that we needed to accomplish more. That was not the case. It was a fairly quiescent situation…. Q: When you left there, it was 1977. What was your impression of the difference in relations between the time you arrived and when you departed? DACHI: What impressed me particularly was the fundamental importance of having a broad dialogue with people in all walks of life, in government and party and other levels. What we did through this dialogue was to clear away the underbrush of problems and misunderstandings that had accumulated after the war, during the Stalinist era and following the 1956 revolution. Nothing much by way of concrete accords was reached while I was there other than the fact that we signed a cultural agreement, which is something our government doesn’t attribute much importance to in any case. But by substantially broadening and extending the dialogue into all sectors, in both official and unofficial, we made it possible to eventually accelerate the process of improving relations. Visits by CODELs [Congressional Delegations] and administration officials at increasingly senior levels also laid a lot of ground work. The flow of international visitors and exchanges was growing. Memories of Cardinal Mindszenty’s 16-year stay in the embassy were fading. Pretty soon the idea of considering MFN or returning the crown didn’t seem quite so explosive anymore. A new ambassador, Philip Kaiser (at left), came to Hungary in 1977, about the time I left. He was a very able and wise man. His personality and skills seemed tailor-made for dealing with the kind of circumstance in which he found himself. And, he had a new brief from a new President, Jimmy Carter, who was looking for ways to distinguish himself in foreign policy from the line taken by Richard Nixon and Gerald Ford. The way Kaiser was put together, he was just the right guy for the time. The crown was returned within a year after I left. It was taken there by the Secretary of State, Cyrus Vance. This was something that had seemed inconceivable a couple of years earlier. So, after having done four years of spadework, all of a sudden, things began to happen. MFN came along sometime in that period also. After that, the normalization process quickly ran its course and brought U.S.-Hungarian relations to a level commensurate with the much more liberal regime in Hungary as opposed to its neighbors. It would have happened much earlier if it hadn’t been for Cardinal Mindszenty’s presence there. Q: What was your impression of Janos Kadar? When he first came in, in 1956, he was certainly the evil genius from the American point of view. DACHI: Kadar was a unique figure. Almost the whole Hungarian communist party leadership spent the period between the First World War and the Second World War in Moscow. Kadar was not one of those. He stayed behind in Hungary. The rest of them were all one hundred percent creatures of Moscow. Matyas Rakosi, who was Stalin’s tool and boss of Hungary during the most brutal years of repression from 1948 until he was deposed shortly before the 1956 revolution, was one of those. These people were Moscow-trained and legitimately deserved the label of puppets. Even though Kadar was one of them in terms of Communist ideology, he was different in that he had spent most of his time in Hungary. To understand the man, it is essential to realize that he regarded himself as the only one among those dedicated Communists who was also a Hungarian nationalist while at the same time remaining ultimately loyal to Moscow. For the thirty some odd years he was in power, his goal as he saw it always was to serve Hungarian national interests first, albeit within the tight Moscow-imposed constraints on all the countries in the East European bloc. Kadar was extremely cognizant of and realistic about the fact that Stalin drew the line for the Iron Curtain as first and foremost a cordon sanitaire against any future German invasion. The next time there was going to be a war, the reasoning went, it was going to start somewhere farther west than on the Soviet border. 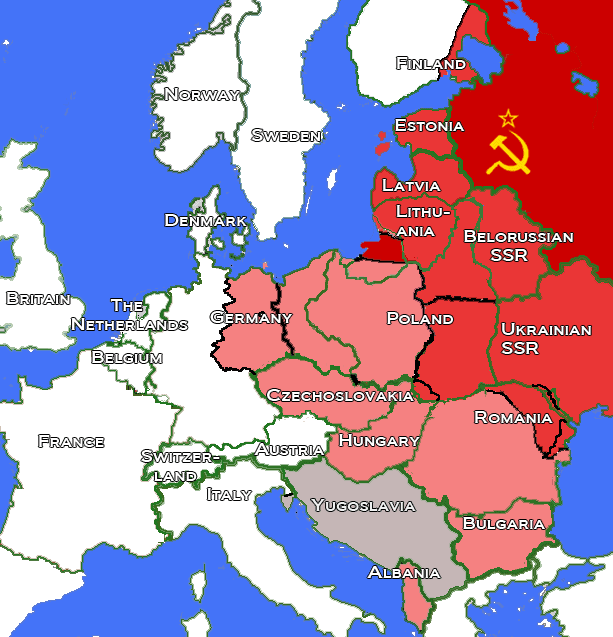 To impart the Communist ideology to the East European countries was secondary to that. Ideology and the Communist dialectic was a tool, the only tool Moscow knew how to use, to impose its control from a strategic and military standpoint and keep the East European satellites in the Soviet camp. What Stalin and his successors had to have were people they could trust absolutely in charge of each of the parties so that there would never be any danger of these people going off in separate ways from Moscow, above all in foreign policy. Most of these people turned out to be heavy-footed, stiff, the worst kind of apparatchiks who truly were puppets of Moscow. Kadar was not such a person. But he realized that if he didn’t adhere to the Moscow line, he could not survive. The bottom line on Kadar is that he got more for Hungary in terms of relative liberalization, economic and cultural, than anyone else could have, by never giving the Soviets anything to worry about on foreign policy or on losing control of the party. They, in turn, gave him more latitude to do liberal things in Hungary that may have looked dangerous from Moscow and would have been unacceptable say in Prague with Dubcek. He tried to do very much the same thing, but he wasn’t trusted. They trusted Kadar because they knew that, in the ultimate analysis, he kept Hungary in the Soviet camp. As long as that was the case, he had quite a bit of leeway. I think that was appreciated on the whole. On the other hand, Kadar realized, for example, that he could never come to Washington on an official visit because he would always be branded as the guy who rode the Soviet tanks into Budapest. 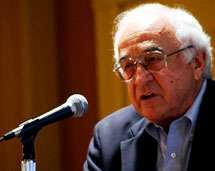 So, his presence and persona, in spite of whatever nuanced interpretation a particular U.S. senior official might give it, imposed a limit to what could be done with him. From the standpoint of the Hungarian-American community here and all the political appearances, Kadar could never be sanitized enough so that he could be brought over here and have the kind of contact that we had with Poland and Romania. Q: Did the Hungarians have the same impression of Kadar, that he was probably the best you could get under the situation? DACHI: Oh, absolutely, and they worded it exactly the way you did. They all realized that this whole Communist thing was a sham, but they knew that Kadar (at left) was good for them because he could get them more than anybody else under circumstances which were totally beyond their control. The intellectuals had their czar, Gyorgy Aczel, who was also personally selected by Kadar and they knew he was the best they could hope for. If you don’t have Kadar, you don’t have Aczel, and so on down the line. So, yes, everybody appreciated it. In the end, as Kadar started getting old, times were changing and the pace of East-West relations picked up. He was actually put aside a year or two before the Iron Curtain came down. He “retired.” The Communists who took his place, much more conscious of the realities of a changing world, were the ones who actually brought down the Iron Curtain by being the first ones to allow the East German tourists to leave via Hungary. That, Kadar could have never done. That was when the whole system from Moscow to East Berlin began to unravel. KAISER: There were two big issues. There was the return of the crown of St. Stephen and there was Most Favored Nation treatment. They were desperate for MFN. They were developing trade. They were developing relations with Germany, he had already visited Germany, with France and he was clearly, compared to Czechoslovakia and Poland, the most relaxed, the most liberal of the communist-controlled countries in central Europe. I think he had visited Bonn and a large number of East Germans used to come to holiday in Lake Balaton in Hungary which is a very attractive area. In fact it was the vacation spot of all of Eastern Europe. We had reached a stage in the relationship where Hungarians could say, “Look it’s time for you to return the crown of St. Stephen and for you to give us the Most Favored Nation treatment.” I picked up the ball on both of them: two very important substantive issues in the relationship between the two countries which were capable of being adequately, satisfactorily adjusted. After getting briefed and reading as much background as I possibly could, I decided – I don’t want to sound too self-serving – it was going to be the objective of my ambassadorship to get satisfaction on both these issues. This was all part of Carter’s policy to loosen the grip that Moscow had on these characters, in Poland, Hungary, and Yugoslavia, too…. [Returning the crown] was violently opposed by the Hungarian-American population, particularly those who had reached here, immigrated to America, after the ’56 revolution. They were located mainly in important political states, Illinois, Pennsylvania, Michigan. Its return was vigorously opposed by the majority of these people. The worst problem I had was a congresswoman from Cleveland who represented a large Hungarian American constituency. But two very significant people approved it. Two guys in that community won the last freely elected, freely chosen election before the Communists took over as prime minister of Hungary. He escaped to America and he testified. This became the subject before the Foreign Relations Committee and he testified in favor of returning the crown. The other guy was…the Commander of the forces resisting the Soviets when they invaded Hungary in ’56, and he said the crown should be returned for the same reason that the President was in favor of it. The arguments were very clear: if you gave it [back], you reinforced or reincarnated or revived the sense of national identity that goes far beyond the Soviet experience, and in that sense weakened the tie with Moscow. It’s true, by the way. The other side said, if you give it back you make legitimate the Soviet occupation. It took quite a bit of doing here. Carter was very interested. Cy [Vance, Secretary of State] pushed it. Carter asked for a memorandum on how to handle it, how to proceed. Hubert [Humphrey, Senator from Minnesota], got word to [Vice President Walter] Mondale to push in its favor in talks with the President, and he assured me that Mondale had done that. Humphrey was amazing. When I called on him, as one did with all the members of the foreign affairs committee, I practically wasn’t in the door when he said, “What are you going to do about returning the crown of St. Stephen?” I had no idea that he even knew about it. He knew more about more subjects than any senator in the United States. Carter finally decided to do it, and, it was resisted by [National Security Advisor Zbigniew] Brzezinski to the very end. Cy (at left) had a deal with the President that every day he would send a memorandum to the President on issues, listed issues that he wanted a Presidential decision on. The guy in New York, [Deputy Secretary of State Warren] Christopher, was taking over that task and he put that item high on the agenda for the President to see tonight. “We expect no problem, you should check in tomorrow morning” and I checked in the morning and they got an okay from Carter for Cy to go ahead and tell the Foreign Minister that we were going to approve the return. He told me — this was the next morning — “There were calls from Brzezinski, he said, ‘Hold this up.’” I said, “I’m very sorry, we’ve got Presidential approval to go ahead.” Cy told the [Assistant] Secretary. He still tried very hard, tried to get the Vatican into the picture. We had to frustrate that effort, and we did. 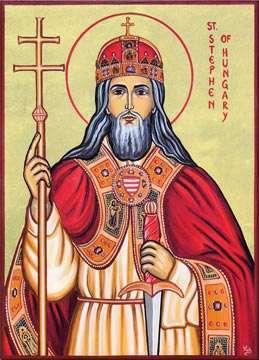 The Cardinal of Hungary was a very good friend and he was actively in support of returning the crown. 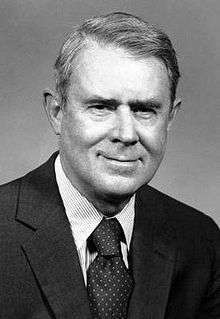 And we had a delegation, [Representative] Lee Hamilton and Senator Stevenson, Adlai’s son, Missouri senator, headed up the delegation. We had one more gimmick so to speak: that this was not a political return, it wasn’t the government returning, it was the American people returning it to the Hungarian people. I got a request. “Could you possibly see to it that Kadar is not present at the ceremony of the return?” (Laughs) I got the Hungarian government to approve Kadar’s absence at the ceremony. We moved the crown to the parliament the day after the mission arrived. I had a special plan. They were going to arrive at midnight. We were waiting, because they were stopping over at a military airport in northern England for a two-hour stopover. I said “Ridiculous, they can gas you up in half an hour.” I got very official about this, very stubborn and ambassadorial. That’s what happened. They arrived about 9 o’clock, and there was a delegation, Hungarian, waiting to receive them. 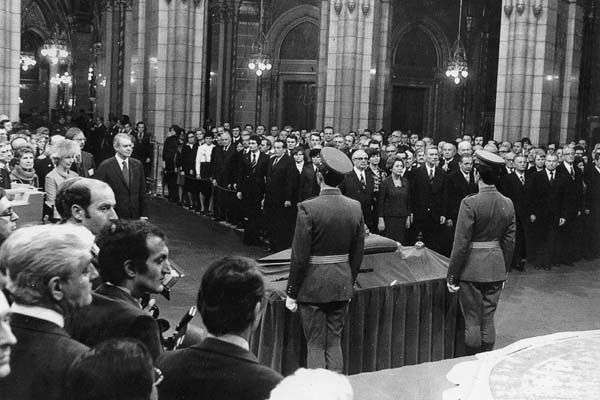 It was quite a ceremony the next day in the parliament when Cy handed over the crown….It was a wonderful atmosphere. We laid down the conditions that any Hungarian who wanted to visit the crown had to be allowed to come in and leave. The crown had to be placed in an appropriate place, like the national museum. At a critical moment, by the way — a little self-serving item, but true. It’s a good ambassadorial story. There was one common goal on the details of the agreement. In one stage fairly early, I had instructions from Washington stipulating certain conditions that the Hungarians had to meet before we agreed to send the crown back. I went to see the deputy Foreign Minister who dealt with the Western world. He looked at the conditions and he said that he would have to get the approval of the authorities, the Politburo so to speak, before he could give his okay. He said, “Well, let me take this up again.” Twenty-four hours later, he said “You can send that cable.” That was the last obstacle we ever had…. The Hungarians were very much, very anxious about getting MFN. This was all part of a liberal economic policy that Kadar had launched. It had a real impact on the economy although when push came to shove, when the issue became political control of the economy, he reverted to the old method. However, the economists, I got to know quite a few of them actually, several of them who were on the academy of science who were allowed quite a bit of leeway in their thinking and what they wrote and so on. Of course, they wanted MFN. When Cy Vance came for the ceremony…, he had a meeting with, not Kadar, but the top guy, the nominal Prime Minister, and they agreed, Cy and he, that the next big step in the relationship was MFN. The big problem of MFN was freely allowing people to emigrate if they so desired. I’m going to be a little immodest. Let me just say this. We discovered in the Helsinki Accord a phrase which stipulated that if you signed this accord you agreed to allow people to emigrate from your country. We used that clause. The Hungarians had signed that agreement as fulfilling the requirement. By the way at that same time Congressman Tom Foley was with the mission. He later succeeded Tip O’Neill and at my suggestion he asked Kadar about his idea about the economy, and Kadar gave an incredible statement, so much so that Foley wrote me a note and said, “This is the best explanation of a free economy that I’ve heard in a long time.” So we used – to get back – the Helsinki provision as indicating that Hungary was meeting the obligations. Q: Did you notice in the streets of Budapest a change in the economy? KAISER: …There were shops, there was no visible shortage. 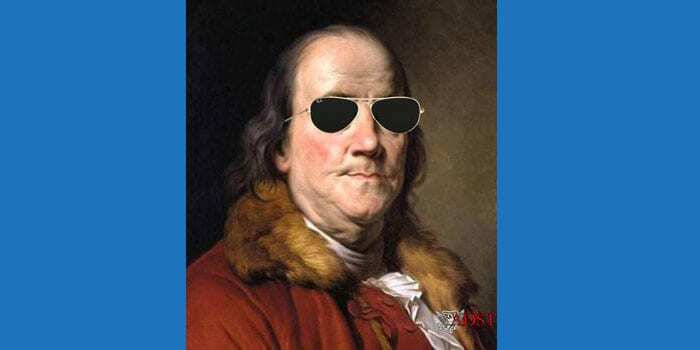 It turned out actually subsequently, they borrowed billions of dollars from abroad, theoretically to modernize the economy and the chief banker, his name was Fekety, and we became very good friends, who generated these funds, was very popular with the central bankers all over the world. When the head of the Bank of England whom I knew heard that I was going to Budapest he told me about Fekety, what a remarkable character he was. It turned out later, they misled the lenders. Instead of using the money for restructuring the economy, it was used mainly to raise the standard of living, to maintain a reasonable standard for the majority of the population. Later on, when democracy was restored, communism was undone, they had an opportunity to do what the Poles did, i.e., to renege, to work out a deal with their lenders so that a good deal of the debt was forgiven. The Hungarians refused to do that and paid a big heavy price literally and figuratively by paying back every dollar they had borrowed…. Q: What in your analysis in your country teams’ analysis brought about the change in Kadar? KAISER: That’s a good question. I think maybe it was a reversion. In the beginning he was very much against the Russians and he was in favor, he belonged to the liberal group that opposed the Russians. They turned it around after the invasion and he decided to become their stooge, but then I guess he reverted back to his earlier days and, the best you could say was, the intimate involvement with the Soviet Union was a fall from grace so to speak. It was not his basic attitude and feeling and that’s why he started the NEM and that’s why he began developing relations outside the country. I think by the time I was there he had visited Germany, he had visited France. I suppose we could say he got religion…. Q: Was this economic freedom having an effect on the political dynamics within the country? KAISER: It certainly affected the general atmosphere. A freer economy inevitably influences the character of the political scene making it freer and more relaxed. There was an ongoing process of freeing more and more of the economy. I was the only diplomat that the head of the trade union movement received because of my labor background. After the crown returned, I was a very popular guy. No ambassador in a communist dominated country had an easier and happier time than I had subsequently. He received me, and he happened to be at that time the head of the [Communist] World Federation of Trade Unions…. And in spite of pressure from Moscow, pressure from East Berlin, they opened up the borders of East Germany who were holidaying in Lake Balaton. This was a major early step to what ended in the collapse and the breakdown of the Berlin Wall. Very significant. And all this can be traced with the changing atmosphere, which was given a big stimulus by the return of the crown. And Carter. Later on he got some credit for it, but not enough credit. That was a major thing he did. It took a lot of guts to do what he did.